Scientists from the Okinawa Institute of Science and Technology Graduate University (OIST), have identified 85 genes essential for fission yeast cells at rest, under nutritionally limited environmental conditions, to maintain their ability to return to the dividing mode. The study sheds light on the genetic network required for resting cells like cancer stem cells to reactivate, and has potential applications in developing new therapies to treat cancer. The study has been published in the journal Science Advances. 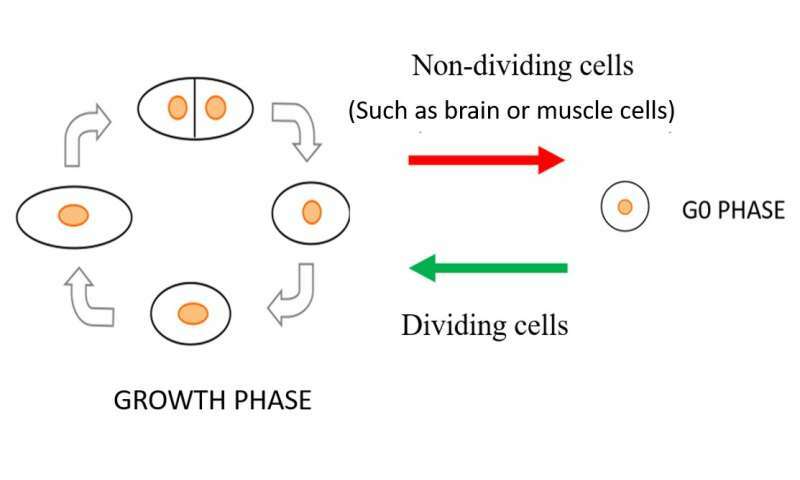 In all living organisms, cells multiply when nutritional and environmental conditions are favorable for cell division. The availability of ample nutrition via a nitrogen source is one of the main deciding factors necessary to initiate the cell division process, as nitrogen is needed to make DNA, RNA and protein. 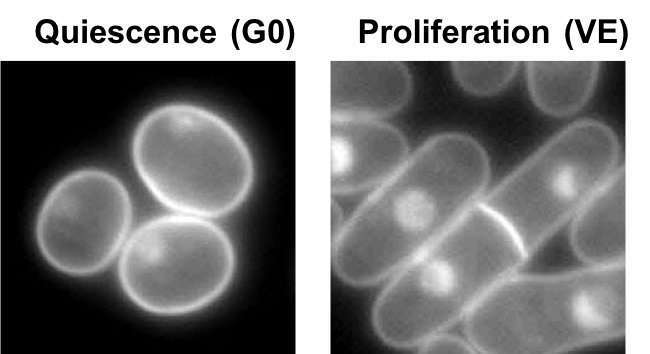 When an external nitrogen source is absent, cells must recycle the intracellular nitrogen source and remain in a non-dividing (quiescent) state, alternatively known as the G0 phase. The medium contains an excess carbon energy source (glucose) so that the metabolism of G0 cells in brain or in muscle is fully active. In the G0 phase, the cells change into shapes different from the dividing mode, and they modify the way they work to cope with the scarcity of the nitrogen source, reactivating for division only when favorable amounts of nitrogen return. This ability of cells to restart the cell division process is referred to as mitotic competence (MC). "Understanding how G0 cells maintain their ability to revive themselves on experiencing favorable conditions is important," says Dr. Kenichi Sajiki, a researcher in the laboratory of Professor Mitsuhiro Yanagida, and the lead author of the paper. For this study, he and his colleagues examined a collection of 3280 fission yeast deletion mutant cell strains that had one of their genes partially or fully deleted. Fission yeast cells were encouraged to grow and multiply by providing them with necessary nutrients. Their nitrogen supply was subsequently cut off to induce the G0 phase. Once the G0 phase was induced, the yeast cells were maintained in this state for as long as four weeks. At the end of that time, they were restored to their dividing mode by resuming their nitrogen supply. Naturally occurring or wild-type fission yeast cells can maintain MC while they are in the G0 phase effortlessly for over four weeks, even after their nitrogen supply had been cut short. However, 85 out of the total 3280 mutant yeast strains examined exhibited shorter periods of MC. The scientists therefore inferred these 85 missing genes to be essential for yeast cells to maintain MC during their G0 phase. To their surprise, nearly half of these genes were reportedly linked to cancer, implicating a tight connection between the maintenance of MC in G0 cells and malignant divisions in cancer cells. Recently, stem cells in a cancerous tumor were found to remain in the G0 phase while being exposed to conventional cancer therapies that target dividing cells, and later reactivate themselves and begin dividing again. The study of these 85 genes might therefore suggest new therapies that target such cancer stem cells. Mutant yeast cells with the shortest MC were missing nem1, a gene related to the de-phosphorylation of proteins. De-phosphorylation is a process necessary for the transfer of signals within a cell, which takes place by changing the activity of diverse proteins. On the other hand, cells devoid of genes responsible for remodeling DNA structure and degradation of unnecessary materials inside cells exhibited longer durations of MC, which implied that these functions were required for prolonging the G0 phase. These observations have therefore helped identify the timing of the required cellular functions to maintain MC. On losing MC, the cells lacking nem1 showcased abnormally shaped nuclei. This was a result of loss of control in the signaling pathway, responsible for degrading cell parts. Dr. Sajiki also found Nem1 to de-phosphorylate another gene product called Ned1, which controls the lipid balance inside cells, and dysfunction of which leads to disintegration of the nucleus. This therefore confirms the association of the two genes nem1- ned1 to play a significant role in protecting the nucleus during the cell's transition from proliferation to quiescence, leading to excessive degradation of internal cell components while maintaining MC. This relationship of nem1 as a regulator and ned1 as a target also suggests a new framework of the genetic network to maintain MC, since supporting studies have showed nem1 was required for MC maintenance exclusively in the G0 phase, while ned1 was required both in the G0 and dividing phases. Some genes may be working as G0-specific switches, and their target genes may be working as housekeeping genes. The scientists named such genes for the G0 switches as G-zero essential (GZE) genes and genes for housekeeping as super housekeeping (SHK) genes, and identified about 80 genes for each group. Professor Yanagida says, "The paper is a real breakthrough for our understanding of how MC is maintained within G0 cells. Two groups of genes, each with less than 100 members, are needed for MC maintenance, and at least in one case Nem1 and Ned1, each representing two groups, directly interacted for protein dephosphorylation. Dr. Sajiki discovered the first group of SHK genes as a graduate student in OIST, and now, nine years later, he and his colleagues in the G0 Cell Unit at OIST have identified a new class of 85 GZE genes. I predict many exciting discoveries for Dr. Sajiki and other researchers interested in fully understanding the relationship of these genes."